~5,000 பேர் கொல்லப்பட்டனர் அல்லது காயமடைந்தனர். சிங்கப்பூர் போரின் முடிவில், பிரித்தானியர்களிடமிருந்து சிங்கப்பூரை ஜப்பானியர்கள் கைப்பற்றினர். சிங்கப்பூர் போரில் 80,000 பிரித்தானிய வீரர்கள் போர்க் கைதிகளாக ஜப்பானியரிடம் பிடிபட்டனர். பின்னர் இரு மாதங்கள் கழித்து ஜப்பானியப் படைகள் மலேசியாவைக் கைப்பற்றினர். Abshire, Jean (2011). The History of Singapore. Santa Barbara, California: ABC-CLIO. ISBN 031337743X. https://books.google.com/books?id=AHF59oExO80C&lpg=PA83&pg=PA104#v=onepage&q&f=false. Allen, Louis (2013). Singapore 1941–1942 (Revised ). London: Routledge. ISBN 9781135194253. Blackburn, Kevin; Hack, Karl (2004). Did Singapore Have to Fall? Churchill and the Impregnable Fortress. London: Routledge. ISBN 0203404408. https://books.google.com/books?id=TUC2qveu-b8C&lpg=PA132&pg=PA132#v=onepage&q&f=false. Church, Peter, தொகுப்பாசிரியர் (2012). A Short History of South-East Asia (5th ). Singapore: John Wiley & Sons. ISBN 9781118350447. Churchill, Winston (2002) . The Second World War (Abridged ). London: Pimlico. ISBN 9780712667029. Coulthard-Clark, Chris (2001). The Encyclopaedia of Australia's Battles (Second ). Crows Nest, New South Wales: Allen and Unwin. ISBN 1865086347. Dennis, Peter; Grey, Jeffrey; Morris, Ewan; Prior, Robin; Bou, Jean (2008). The Oxford Companion to Australian Military History (Second ). Melbourne: Oxford University Press. ISBN 0195517849. Drea, Edward (April 1991). "Reading Each Other's Mail: Japanese Communication Intelligence, 1920–1941". The Journal of Military History 55 (2). ISSN 1543-7795. Farrell, Brian; Garth Pratten (2011) . Malaya 1942. Australian Army Campaigns Series – 5. Canberra, Australian Capital Territory: Army History Unit. ISBN 978-0-9805674-4-1. Gillison, Douglas (1962). Royal Australian Air Force 1939–1942. Australia in the War of 1939–1945. Series 3 – Air. Volume 1. Canberra: Australian War Memorial. OCLC 2000369. https://www.awm.gov.au/collection/RCDIG1070209/. Stanley Woodburn Kirby (1954). War Against Japan: The Loss of Singapore. History of the Second World War. Volume I. HMSO. OCLC 58958687. Leasor, James (2001) . Singapore: The Battle That Changed The World. London: House of Stratus. ISBN 9780755100392. https://books.google.com.au/books?id=Tl9tx4MJYf4C&pg=PA246&dq=I+think+you+ought+to+realise+the+way+we+view+the+situation+in+Singapore.+It+was+reported+to+Cabinet&hl=en&sa=X&ei=At1FVafbC4PWmAW3zoHAAw&ved=0CCIQ6AEwAQ#v=onepage&q=I%20think%20you%20ought%20to%20realise%20the%20way%20we%20view%20the%20situation%20in%20Singapore.%20It%20was%20reported%20to%20Cabinet&f=false. Morgan, Joseph (2013). "A Burning Legacy: The Broken 8th Division". Sabretache (Military Historical Society of Australia) LIV (3, September): 4–14. ISSN 0048-8933. Murdoch, Lindsay (15 February 2012). "The Day The Empire Died in Shame". The Sydney Morning Herald. http://www.smh.com.au/national/the-day-the-empire-died-in-shame-20120214-1t462.html. Murfett, Malcolm H.; Miksic, John; Farell, Brian; Shun, Chiang Ming (2011). Between Two Oceans: A Military History of Singapore from 1275 to 1971 (2nd ). Singapore: Marshall Cavendish International Asia. OCLC 847617007. Frank Owen (politician) (2001). The Fall of Singapore. London: Penguin Books. ISBN 0-14-139133-2. Richards, Dennis; Saunders, Hilary St. George (1954). The Fight Avails. Royal Air Force 1939–1945, Volume 2. London: Her Majesty's Stationery Office. OCLC 64981538. http://www.ibiblio.org/hyperwar/UN/UK/UK-RAF-II/index.html#contents. John Toland (author) (1970). The Rising Sun: The Decline and Fall of the Japanese Empire 1936–1945. New York: Random House. ISBN 9780394443119. Wigmore, Lionel, தொகுப்பாசிரியர் (1986). They Dared Mightily (2nd ). Canberra: Australian War Memorial. ISBN 0642994714. Wigmore, Lionel (1957). The Japanese Thrust. Australia in the War of 1939–1945. Series 1 – Army. Volume 4. Canberra, Australian Capital Territory: Australian War Memorial. OCLC 3134219. https://www.awm.gov.au/collection/RCDIG1070203/. Seki, Eiji (2006). Mrs. Ferguson's Tea-Set, Japan and the Second World War: The Global Consequences Following Germany's Sinking of the SS Automedon in 1940. London: Global Oriental. ISBN 1-905246-28-5. https://books.google.com/books?id=u5KgAAAACAAJ. Tsuji, Masanobu (1960). 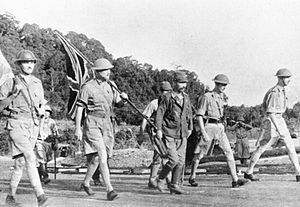 Japan's Greatest Victory, Britain's Worst Defeat: The Capture of Singapore, 1942. Singapore: The Japanese Version.. New York: St. Martin's Press. விக்கிமீடியா பொதுவகத்தில் Battle of Singapore என்னும் தலைப்புடன் தொடர்புடைய பல ஊடகக் கோப்புகள் உள்ளன. ↑ Allen 2013, பக். 300–301. ↑ Blackburn & Hack 2004, பக். 74. ↑ Blackburn & Hack 2004, பக். 193. ↑ Allen 2013, பக். 169. ↑ Toland 2003, பக். 272. இப்பக்கத்தைக் கடைசியாக 12 திசம்பர் 2018, 16:29 மணிக்குத் திருத்தினோம்.